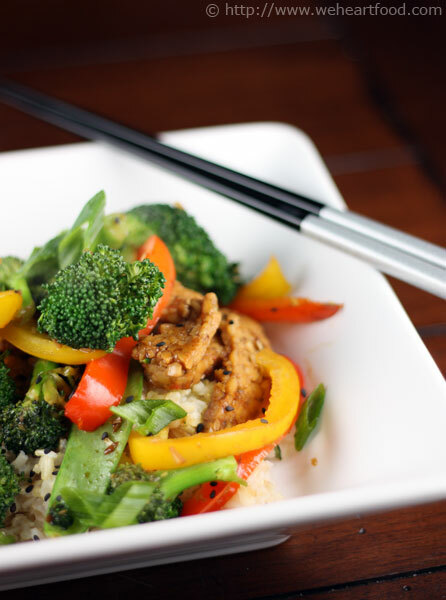 Tonight’s Vegetarian Week feature comes from the Washington Local and Seasonal Cookbook: tempeh, broccoli, and peppers are quickly stir fried with a sesame-soy marinade and served over a bowl of brown rice. This recipe is really quick to make — the longest part will be waiting for your rice to cook, so get that going right away. In a small bowl, combine the soy sauce, mirin, miso, sesame oil, and cornstarch. Whisk until well blended and set aside. Heat the oil in a large skillet over medium-high heat. Add the ginger, garlic, and lemongrass and saute for 1 minute or until it just starts to brown. Add the tempeh and saute for 2 minutes, then add teh broccoli, peppers, and snow peas and saute for an additional 2 minutes. Add the reserved marinade and cook for 1 minute, until sauce thickens a bit. Remove from the heat and stir in green onions, sesame seeds, and salt. Serve over rice.